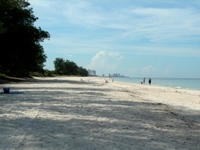 Southwest Florida Beaches. From Anna Maria to Marco Island. Beginning at the mouth of Tampa Bay and Egmont Key and ending at Marco Island, the southwest Florida Beaches are the safest and most geologically diverse beaches in the state. If you want to find shells, these are the beaches to visit. No two beaches are the same.